New Delhi November 23.2014 Geeska Sports: Ethiopian runner Guye Adola demolished the course record to emerge triumphant in the international elite men’s category, while Florence Kiplagat led a Kenyan one-two finish in the women’s event of the Airtel Delhi Half Marathon on Sunday. Adola stopped the clock at 59.06 minutes to break the record set by countryman Atsedu Tsegay last year. He edged past 2014 World Half Marathon champion Geoffrey Kamworor, who finished the event with a timing of 59.07 minutes. Mosinet Geremew of Ethiopia was third after clocking 59:11 minutes. In the International Elite Women category, defending champion Florence Kiplagat of Kenya won with a timing of 01:10:04 beating compatriot Gladys Cherono (01:10:05). Ethiopian runner Worknesh Degefa finished third with a timing of 01:10:07. Coming into the Delhi marathon, Adola had settled for bronze in 2014 World Half Marathon competition that was won by Kamworor. “The competition was very stiff due to the early morning cold of Delhi. I am very happy to have overcome it,” Adola said. In the women’s category, reigning World Half Marathon champion Gladys Cherono was stunned by two—time world champion Kiplagat. 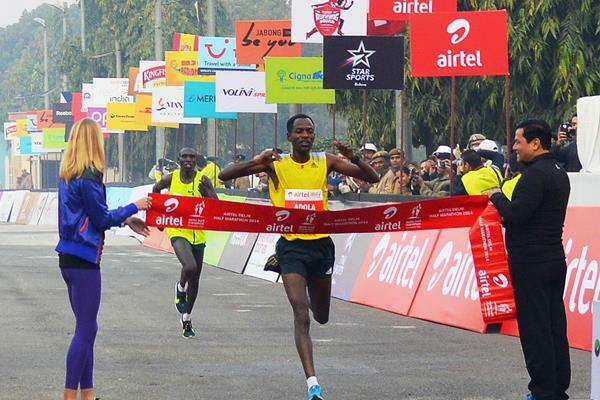 India’s Suresh Kumar and Preeja Sreedharan also emerged victorious in the Delhi Half Marathon. Suresh completed the 21.1 km race in an hour and 04.38 minutes while second placed Nitender Singh Rawat and third placed Kheta Ram were slower by 16 and 18 seconds, respectively. In the women’s category, Preeja retained her title with a timing of an hour and 19.03 minutes while Monika Athare and Sudha Singh took second and third positions, respectively. Monika finished the race in an hour and 19.12 minutes, which was nine seconds faster than London Olympian Sudha’s effort. Previous articleWhat Africans Can learn from Burkina Faso.